Bangus is one of the relatively unexplored grasslands and unknown tourists paradise situated in the North Western periphery of Tehsil Handwara of District Kupwara, 128 Kms Approx away from Srinagar, summer capital of Jammu and Kashmir (India). The said grass land is at an altitude of about 10,000 ft above sea level. Occupying an estimated area of 300 Sq Kms, Bangus is surrounded by Shamsbery ranges and Leepa valley. Word “Bangus” is derived from Joining two words “ Ban “ derived from Sanskrit word “ Van” meaning “ forest” and “ Gus” meaning “ Grass” ,so it is a meadow with lush growth of wild grass. The Bangus valley has variety of flora, considered ideal for cattle grazing. The area is supposed to have been discovered by an unknown nomad, while grazing his cattle. This is by far the most productive land in this area as it provides a largest niche for producer-consumer relationship. In the summer season numerous cattle and sheep are seen grazing in these meadows which are sent from the adjoining areas by the locals. Bangus valley is surrounded by Chowkibal Mountains on the northern side, Qazinag and Shamsbery Mountains on the western side. Besides other hills also seem to provide protection to the grassland namely; Meeldar, Nastichavan and Yaddil etc. Bangus comprises a mountain biome which includes grassland biome with flora at Lower altitudes and coniferous forests at a higher altitude. An area of 300 sq. Km is proposed to be protected biome under the name of Bangus valley.In the deep valley is a marshy type grass land which is traversed by a small stream popularly known as Tilwan Kohl. Bangus Valley is128 kms Approx from Srinagar via Kupwara, west of Srinagar. This area called Lolab valley One of the most beautiful valleys in the whole state, huge meadow is 6 kms wide and 19 kms long surrounded on all sides by pine forests with a stream flowing through . It was one of the popular valley for British Tourist upto 1947. This valley is also famous for caves of Kala Roos and one can see stone age wall paintings. There is legend that some of the caves go right up to Russia. 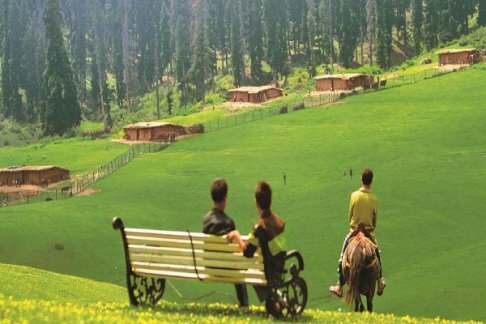 There are forest rest houses or one can stay in tents..
As we have many travel agents in Jammu and kashmir who is exploring new places in Kashmir and Online Holidays is one of them the most poppulartravel agent in kashmir reputed as a young travel agent in kashmir. Online Holidays Top 10 Travel agents in kashmir has lots of experience of trekking and hiking with there professional Guides and we have over own Tents special for un-Explored places. Spell bounding natural setting, adventurous trekking trails, snowcapped undulated hilly terrain and the pleasant climate during springs and summers make the trekking expedition in Bangus Valley a wonderful experience.Bangus valley is surrounded by Chowkibal Mountains on the northern side, Qazinag and Shamsbery Mountains on the western side.